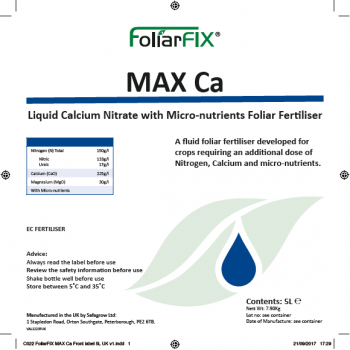 A soluble liquid containing Calcium, Nitrogen, Magnesium and Micro-nutrients for Foliar Application. N 150 (Nitric 133, Ureic 17). B 0.75, Cu (EDTA) 0.60, Fe (EDTA) 0.75, Mn (EDTA) 1.50, Mo 0.01, Zn (EDTA) 0.30. MAX Ca should only be stored in its original container. The product should be stored away from direct sunlight and in frost free conditions, between 5˚C and 35˚C. Slight thickening and crystallisation can be a product characteristic under certain conditions. Containers should be shaken before use and rinsed thoroughly. Thickened product entering the spray tank will naturally disperse when mixed and diluted. Read the label before use. Shake bottle well before use. Half fill spray tank with water and begin agitation. Empty the required quantity into the spray tank, mix until dissolved or dispersed and add the balance of the water. Ensure agitation is maintained throughout the spraying operation. Do not allow the spray tank agitation to stop whilst product remains in the tank. Apply to the crop. MAX Ca is tank mixable with most spray applied chemicals. Read all labels carefully and adhere to the instructions for use and advice regarding whether or not the products should be co-applied. If mixing products in the spray tank, add product first. Many variables outside the control of Safagrow can influence the performance of co-applied products and therefore co-application is entirely at the risk of the end user. Do not allow product to enter water courses un-diluted. Triple rinse emptied containers adding the rinsate to the spray tank. Handle empty containers and their residues as established and in accordance with local legislation and guidance. MAX Ca is a non-hazardous for transport, non flammable product and does not pose any significant health risk if used in accordance with the label and usage information. The correct Personal Protective Equipment must be worn whilst using, please refer to SDS section 7. Keep out of the reach of children. Do not store near food. Do not reuse container. Safagrow guarantees the content of the components as indicated on the label. The buyer assumes all risks regarding the use and management of the product. The product is compatible and can be mixed with many pesticides and nutrients but not all. However, Safagrow cannot accept any liability for any loss or damage resulting from tank mixes, as it is impossible to screen all possible mixes and conditions. Safagrow recommends the buyer tests the proposed mix on a small scale first. © 2019 Safagrow Limited. All rights reserved.